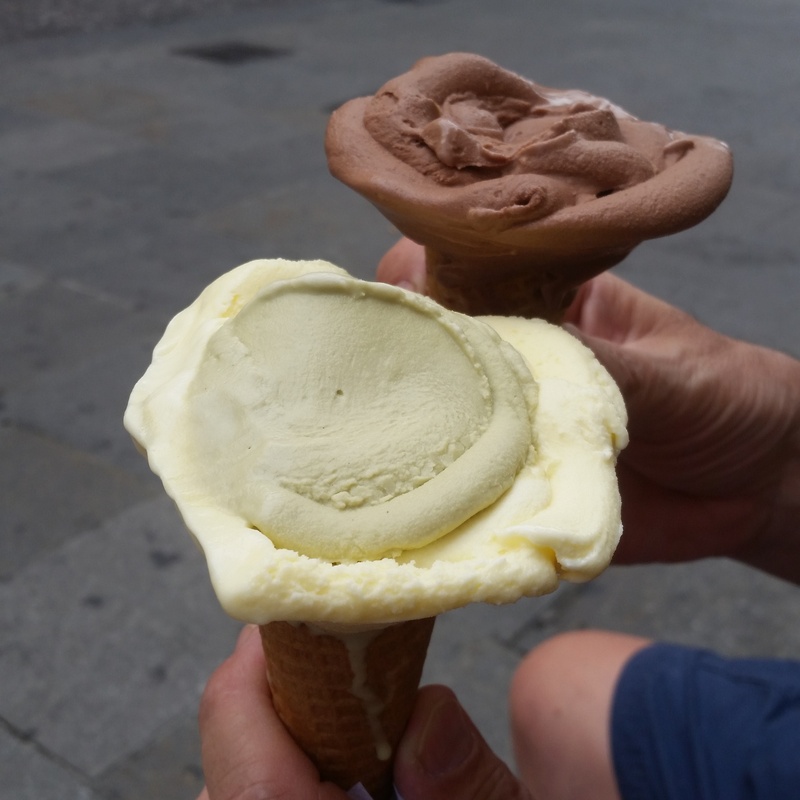 There is a lot to be said about gelato in Italy. There seems to be a store on every street. The flavors are pretty much all the same, with a few exceptions now and then. Cups and cones are obviously the vehicles to put the yummy stuff in. Some cones are made into flowers, some cups come with a cookie. 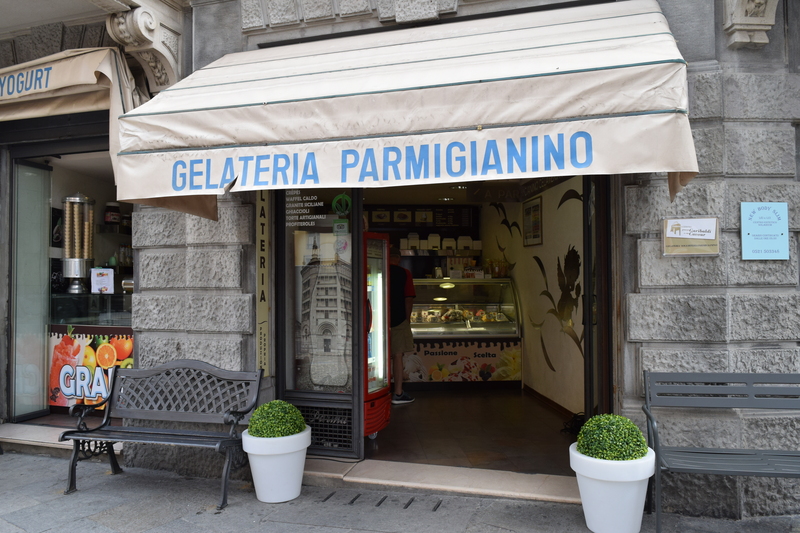 There is a new place we tried in Parma (picture below) that has a type of whipped cream they call “Creme Parmigianino” because that is the street they are located. It is to die for. We have tried it with gelato and with fruit gelato. There are almonds, sugar granules (we think) and it is just so good. I was thinking the next time just asking for that but I think the owner would give me ‘a look’. Who knows, perhaps you are ‘allowed’ to just have that; I’ll see how brave I am to ask – next time. Gary paying for our gelato. That whipped cream stuff is in the front row, second to the left. Ahhhhhh!!! 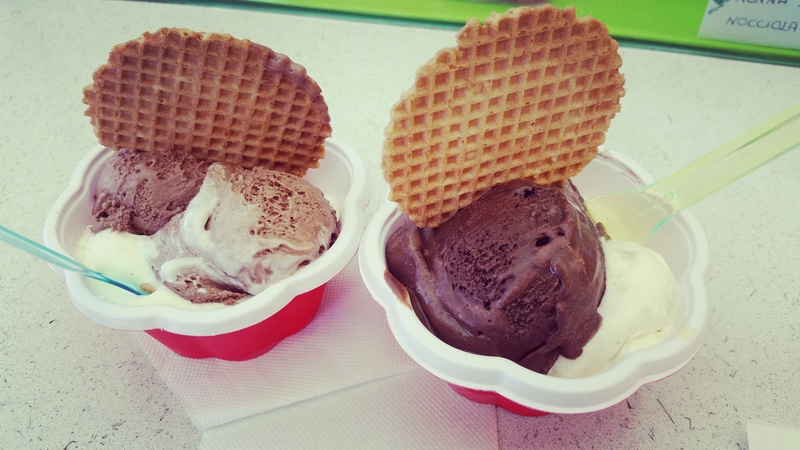 So what is the difference between gelato and ice cream? Gelato is the Italian word for ice cream so “technically” they are the same. However we all know that there’s a big difference between the soft, smooth texture, and clean taste of gelato compared to American-style ice cream’s heavier, richer texture. It comes down to these factors: fat, sugar, air and serving temperature. Gelato has less fat in the base when making and less air churned into it during the freezing process. American-style ice creams are generally heavy on cream and have a fat content of at least 10% (which can be considerably higher in most homemade and many premium versions). Gelato uses more milk than cream, so it doesn’t have nearly as much fat. This is the place that makes the pretty flower cones. Some other places do too but this is place is on our street!! American-style ice creams are churned quickly to whip in plenty of air (called overrun) which is helped by the high proportion of cream in the base. 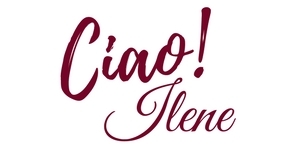 Gelato is churned at a much slower speed, which introduces less air into the base. 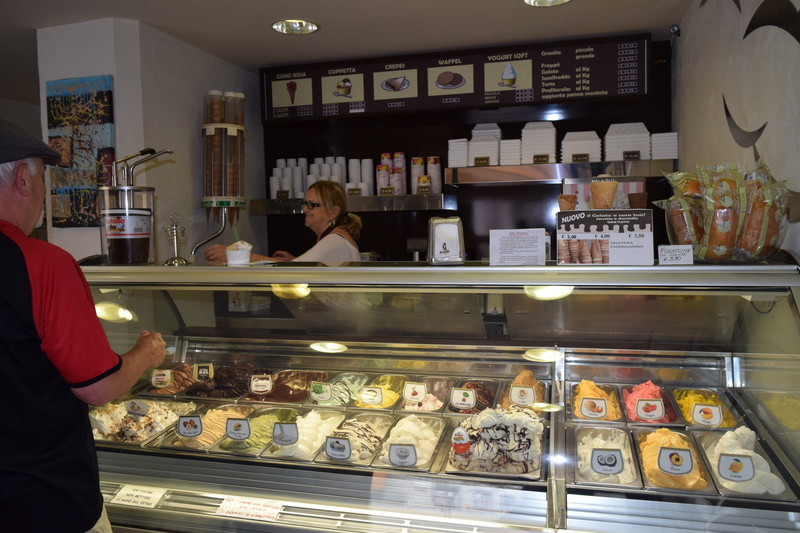 So, gelato has a dense, silky texture that’s less creamy than the heavy fat American-style ice creams. So there you have it, which do you prefer? Editors Note: This post originally appeared on August 31, 2016. I have been asked recently to repost this information.